304 grade stainless steel is an austenitic type of stainless steel. While austenitic stainless steels are very common, there are also ferritic, martensitic, duplex and precipitation hardening types of stainless steels. 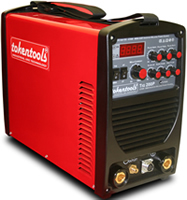 You can MIG weld thin gauge stainless steel in a short circuit mode with compact type 240V input power MIG welders. The machine would have the same amperage and resulting material thickness capability with stainless steel as it does with carbon steel. The coefficient of thermal expansion for austenitic types is about 50% greater than carbon steel, which could result in more distortion. Therefore, to help minimize warpage (particularly on sheet metal), weld at the lowest current or “heat” level possible, which still provides complete fusion between the wire and base plate. Second, stainless steel has lower thermal conductivity, meaning that heat energy does not transfer or move away from the weld zone as fast. 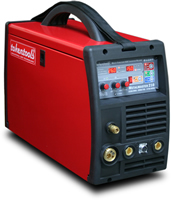 This is beneficial in welding, in that it therefore does not require as much current to achieve complete fusion because the heat is not being pulled away from the weld zone as rapidly. Stainless steel also has lower electrical conductivity (i.e. higher electrical resistance). This means that wire feed speeds at the same rate as used with carbon steel will produce lower current levels with stainless steel. In addition, maintaining a consistent contact tip to work distance (CTWD) is more critical with stainless steel, as variations result in a greater degree of change in current levels. Finally, stainless steel’s main attribute is its corrosion resistance (i.e. it does not rust like carbon steel). This property is achieved with much higher levels of alloys in the base material (namely chromium and nickel). However, these higher levels of alloys also decrease the weldability of stainless steel, in that it has a more sluggish or ropy weld bead characteristic. Now translate these property differences into the various parameters needed in order to MIG weld stainless steel. First, the machine should be set on DC+ (direct current positive) polarity. 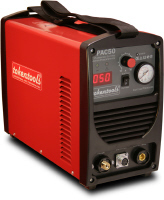 Regarding wire feed speed and voltage settings, most of these compact MIG welders have a recommended settings chart on the door. However, the chart may not have settings for stainless steel. If not, or if none are found in the machine’s instruction manual, then as a starting point use the chart’s recommended settings for carbon steel, based on the thickness of the stainless steel sheet metal in which you are welding. Then adjust the settings from there to fine tune the weld. In general, you will likely need to run a little higher wire feed speed rate than used with mild steel, but which will still likely result in a little lower current level. In addition, you will likely need to use higher voltage settings, which will help wet out the puddle more, giving a flatter face and better wash-in at the toes of the weld. You do not need any special options to feed the wire (such as the spool gun recommendation for aluminum wire). However, you will need to use a stainless steel MIG wire. I would recommend 0.030″ diameter, on either a two pound or ten pound spool. For your particular application, use a 308LSi grade. In general, the grade of wire you use depends on the type of stainless steel base material you are welding. The three most common grades of austenitic stainless steel wires are 308, 309 and 316. These wire grades may also have a “L” designator, indicating that the wire’s carbon level falls in the low end of the carbon range. I would also recommend a grade that has a “Si” designator, indicating a higher silicon content, which provides more puddle fluidity. Examples (see Figure 2) would include Harris 308LSi, Harris 309LSi and Harris 316LSi wire. Note that the short circuit mode of metal transfer is a lower arc energy or lower heat input process, compared to other arc welding processes. While it helps reduce the chances of burn-through on sheet metal, it also produces a colder, ropier weld bead. With stainless steel welding, the issue is compounded by the fact that stainless steel has a more sluggish weld bead (as discussed already). Therefore, the recommended shielding gas to use for short circuit stainless steel MIG welding is a tri-mix shielding gas, such as 90%He/7.5%Ar/2.5%CO2. The high thermal conductivity of helium helps provide a flatter weld bead and good fusion into the base plate. While high helium blends can be more expensive than other types of shielding gases, the high percentage of helium in the mix helps counteract the cold, sluggish bead characteristics. The other gases in the blend provide good arc starting characteristics. Therefore, you do not want to use a completely inert shielding gas, such as 100% helium or 100% argon. In addition, you do not want to use the same type of shielding gas that you use with carbon steel wire, such as 75%Ar/25%CO2 or 100%CO2. Both carbon and oxygen from the shielding gas react with the stainless steel in the heat of the arc, resulting in some oxidization and reduction in corrosion resistance. The maximum level of oxygen or carbon dioxide that should be used in a shielding gas mix with stainless steel is 3% or 5% respectively.